Portraits of children occupy an important place in art history, and few are more beloved than Francisco Goya’s Red Boy, one of the Met’s iconic paintings. Manuel Osorio’s portrait, painted when he was three or four, is neither saccharine nor that of a miniature adult. Three cats, one leashed magpie, and a cage filled with gold finches accompany him. The red of his jumpsuit is gently modulated, as is the grey background. The satin of his white sash and small shoes reflects the light, as do his diaphanous collar, his hands and innocent face. The little man, looking out of his typical black Goya-esque eyes, reflects poise and authority. In 1787, the ancestor of the Banco de España commissioned portraits of its directors from Francisco Goya. 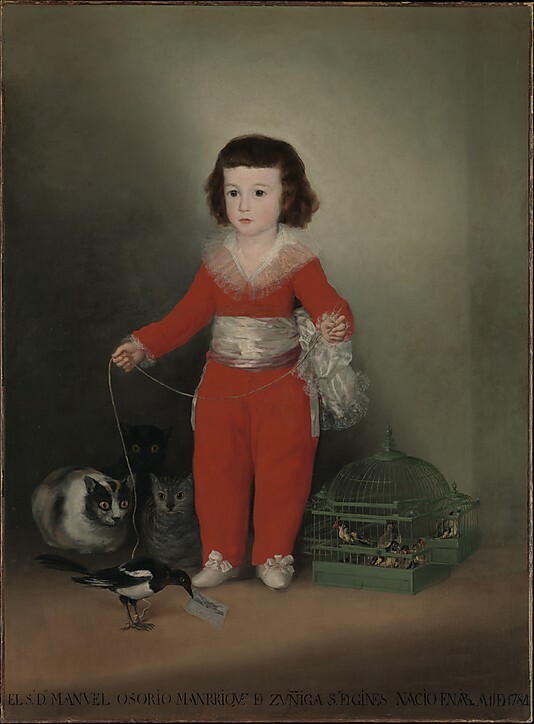 One of these, Vicente Joaquin Osorio, the count of Altamira, was so pleased that he engaged forty-two-year-old Goya to paint the rest of his family. During the next two years Goya finished the double portrait of the countess Altamira and of her daughter Maria Agustina, as well as that of Manuel and of his older bother Vicente, heir to the fortune. The latter, aged about ten, wears a wig, a gold-colored adult suit and a sword. Agustin Esteve y Marquez, a pupil of Goya, painted Juan Maria Osorio, another one of Manuel’s brothers. Restorers effectively destroyed that image. The portraits remained in the eventually impoverished Altamira family until about 1870, when they were sold. Bernstein, a French art-dealer, sold Manuel to Duveen who sold him to Jules S. Bache, a New York banker and collector. Robert Lehman, another American banker and collector, bought the Countess and her daughter from a French dealer in Paris in 1911. Both collectors left the portraits to the Met in 1946 and 1979, respectively. Keith Christiansen, Chairman of European Paintings, regretted that the two paintings seldom meet, since the Lehman gift is sequestered in its own pavilion. As a special treat the museum organized a family reunion of the four Altamira portraits in the spring of 2014. The commute of Manuel Osorio, the Red Boy, and of the Countess de Altamira was minimal. The Banco de España lent the portrait of the Count, who initiated the Goya commission, and a private owner contributed Vicente Osorio. The Cleveland Museum lent Juan Maria. For the first time ever, the five portraits were in one room. It is a rare privilege to study these portraits, painted when Goya was about to reach his zenith. The Altamiras have a family look, though each member clearly has his or her own attributes and personality. Details abound. Perhaps because he was the least important member of his family, the portrait of Manuel is the most spontaneous and informal. The countess is beautiful and very serious, stiffly holding an infant dressed in adult clothes. Vicente’s miniature adulthood made me smile. I am glad that Goya gave him an affectionate, lively spaniel. The portrait of Count Altamira is a tour de force. He was a dwarf and Goya handles his minuscule stature realistically and with dignity. Xavier F. Salomon, the Met’s former curator of Southern Baroque Paintings, organized the exhibition before leaving for his new post as chief curator of The Frick Collection. He also wrote the Metropolitan’s Spring Bulletin, which provides a fascinating account of Goya’s early career. This entry was posted in Art review and tagged Altamira, art, art museums, Banco de España, count of altamira, fine art, francisco goya, goya, goya and the altamira family, Juan Maria Osorio, keith christiansen, manuel osorio, metropolitan museum of art, new york, new york city, nyc art exhibits, nyc exhibits, nyc museums, red boy, spanish art, Vicente Joaquin Osorio, xavier f salomon. Bookmark the permalink.